What’s better than watching a movie? Cruising to the locale where the movie was filmed, of course! We rounded up five movies featuring cruise-able destinations. From the Keys to the Caribbean and beyond, you’d be surprised at how many locations featured in your favorite films are accessible by boat. Go ahead and cruise to the movies. The classic movie was filmed in, you guessed it, Key Largo. In this 1948 film, a man (Humphrey Bogart) visits his old friend’s hotel and finds that a Cuban gangster has taken over. As a hurricane approaches, confrontation and drama ensue. The local community embraced the film and to this day, Key Largo hosts the annual Humphrey Bogart Film Festival. The 2018 festival will be held at Playa Largo Resort, which has marina facilities. Who hasn’t watched this movie and dreamed of deserted island beaches and turquoise waters? You’re in luck—parts of the movie were filmed on Petite Tabac, one of five tiny inlets that make up the Tobago Cays in the Grenadines. 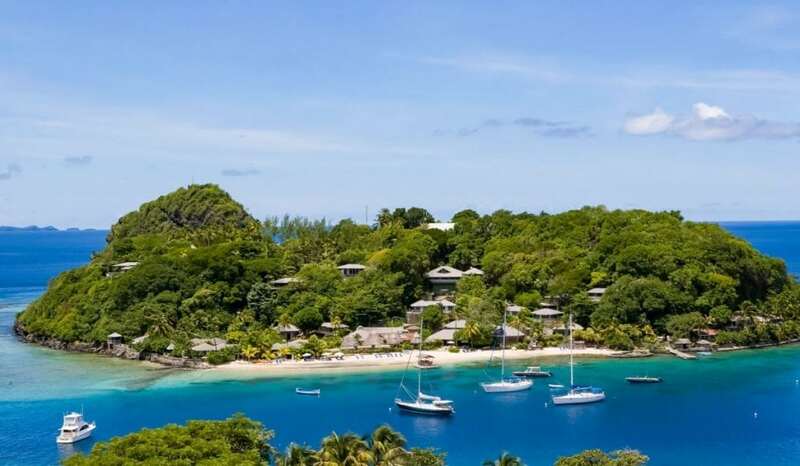 You can take your tender to the remote location if you stay on Young Island, which is the resort where Johnny Depp stayed during parts of filming. Maybe the movie doesn’t inspire the urge to swim, but Steven Spielberg’s breakout film does accurately convey the beauty of Martha’s Vineyard. The summer haven in Massachusetts is composed of six separate towns, most of which saw filming action, though credited as fictional Amity Island. Edgartown and Oak Bluffs are very accessible and popular boating destinations in the summer. Avid movie fans can even follow the path of the famed Great White with a map of the filming locations. The first in the James Bond film series, Dr. No was filmed in Jamaica. One of the most memorable locations, Laughing Waters Beach, is still as beautiful as the day Ursula Andress emerges from the sea. While there are no marina facilities at the protected Laughing Waters Beach, you can dock at nearby Errol Flynn Marina. The 1984 fantasy/comedy was filmed in part on the former Gorda Cay in The Bahamas. The island was bought by Disney as a private island back in 1997, so technically still cruise-able if on a Disney Cruise. Other filming locations in the film that are still accessible to the public include dive sites in Nassau; you can get to these sites with companies like Stuart’s Cove. What is your favorite movie? Can you get there by boat? Like this? You’ll love our Top Ten Boat Movies.